When certain parts of life feel too difficult, that’s when it’s time to make a big change. I know, sounds cliche, but that’s what my husband and I had to do when we were faced with huge money issues. It was a strain on the both of us and extremely stressful. We were tired of going nowhere in life while the car kept on costing us money and new bills were popping up. And that’s what fuels this blog; showing people new and legitimate ways to work from home (or anywhere). When I found that I could actually make a living from a blog and pursued it (instead of going the lazy route and taking a minimum wage job to make our money issues easier), my husband and I gained freedom from the 9-5 and the ability to travel within 3 months. Now I knew that blogging wasn’t for everyone, so I started to look for other ways that my audience could make a living from home, and one of them is proofreading. I know that many of you love to read and would love to get paid for that(who wouldn’t?). And a site that offers an online course called, Proofread Anywhere (seems fitting right? ), had yielded so many success stories that I could NOT overlook it. Now one of the stories that I found impressive was of a single mother who was stuck in a dead end job. Her name is Patti, and after taking the 7-Day Free Course, she was able to determine that this was her way out of working a job that was taking her nowhere. So let’s see how this worked for her. When taking this course, Patti realized that it helped her to be teachable. 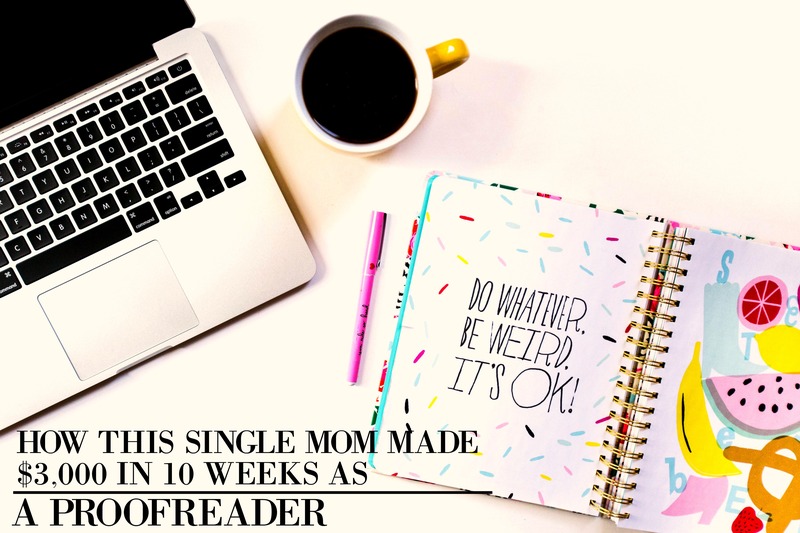 Yes, she had a bit of experience from the past, but being able to humble herself only helped her to become an amazing proofreader and start to get clients that loved her. She also started to have a sense of accomplishment, which she hadn’t had in a long time. After working a degrading job for over a decade just to provide for her daughter, being able to succeed in finishing difficult projects and giving her clients quality work, helped her self-worth. In some of my other case studies on people who have succeeded after taking Proofread Anywhere, some only take a couple day or a couple weeks to find their first client and start making great income. But for Patti, it took her a month. I tell you this because I don’t want you to be fearful or worried about taking this course only to find no clients. Caitlin who created this online class is extremely helpful and has made it near impossible to not find a client. Yes, it took Patti a month, but she was still able to start the process of getting consistent work and start planning when she’ll quit her job. Now some people think that they need an English degree or at least a college degree. And I get it, many people require you to have some sort of qualification just to get the job. However, when becoming a proofreader (and especially after taking this course), you’ll have all the experience you need. You don’t have to worry about being rejected for something you don’t have. Patti didn’t have an English degree or even a college degree, but she didn’t let that stop her from pursuing something that would get her ahead in life. Now whether you’re a single mom with a job you hate, someone who wants to work from home, or a person who wants to pursue their dreams/goals without being tied down to a full-time job, this online class can do just that for you. Yes, it can be a bit intimidating with the thought of quitting your day job; there are a lot of unknowns. But if you’re willing to take the leap and pursue something that’ll get you out of the draining 9-5 that doesn’t get you anywhere in life, then this can benefit you immensely. I fully encourage you to try the 7-Day Free Course to see if this is something for you, and then jump into it. Find a way to buy your own freedom and get away from the corporate or retail world. Now if you have any questions about Proofread Anywhere, feel free to let me know in the comments down below. I’d love to hear about them!